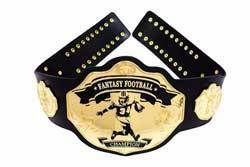 A fantasy championship belt is one of those fantasy football winner ideas that can earn you commissioner of the year honors. Whether you're looking for a championship belt for your fantasy football league, your fantasy baseball league, or even a special belt for your dad on Father's Day, Undisputed Belts has covered. Although they make some of the most incredible and affordable championship belts on the market, their product line doesn't end there. They also sell cool fantasy fantasy trophies, rings, and other accessories to round out an impressive collection of fantasy sports and award merchandise (although at the time of this writing they do not sell funny fantasy football loser trophies. In this Undisputed Belts review, I'll break down their entire product line so you can decide if they're the right fantasy football prize merchant for your league. As their name suggests, Undisputed Belts' flagship product is their line of championship belts. They claim their company and championship belt ideas was inspired by Aaron Rodgers (and to a lesser extent, Steve Novak). But what started as a site selling strictly fantasy football belts has expanded into other sports and genres. Undisputed Belts is now producing custom-designed belts that are used as prizes for many groups and organizations, including video game fanatics and comic book clubs. They sell what I believe is the best custom fantasy football belt on the market. Based on their rapid expansion of championship belts, I can only imagine that the selection of belts will continue to grow. As I mentioned before, Undisputed Belts sells more than just trouser bling. They actually have an impressive collection of fantasy trophies. Normally, award merchants that do not specialize in trophies will throw a few cheap trophies into their product line to fill things out. But that is not the case here. The trophies offered by Undisputed Belts are unique and high quality. You won't find any cheap trophies on their site and I think you'll be impressed with the designs. When it comes to their championship rings, I'm not as impressed. Unlike their trophies, the rings just seem a bit inferior. If I'm going to make the commitment to wear a fantasy championship ring, I would aim for something much gaudier than what they offer. But that's admittedly a personal preference. However, the rings are priced very reasonably. So if you're looking for a low-cost ring to award to your league champion each and every year, you might find one that fits the bill. If it's a ring you're looking for, you can also check out my article on the best fantasy football rings for 2018. One of the knocks on fantasy championship belts is that they are typically made from PU leather, which is a cheaper, synthetic version of real leather. You can read about the differences in detail in my article: The Best Fantasy Football Championship Belts. To quickly summarize, some people dislike PU leather because it isn't as durable as real leather. In reality, your championship belt is unlikely to get as much wear and tear as a belt you would wear with your jeans, so I doubt that is a valid concern in the real world. If the use of synthetic leather is a concern, you'll be happy to know that Undisputed Belts now allows you to upgrade from PU to genuine leather when purchasing a fantasy football championship belt. It'll cost you a little extra, but you can rest easy knowing you'll get many, many more miles out of your belt. When it comes to pleasing their customers, these guys have it figured out. But don't take my word for it. Just check out their insane customer and decide for yourself. If you've spent any time researching fantasy championship belts on the Internet, you know that many belts are sold as-is with generic artwork. They provide no way to customize the belt. There are a couple of fantasy sports merchants that add blank side plates to their championship belts that you can have engraved by a third party. Undisputed Belts does this for some of their belts as does one of their primary competitors, Fantasy Jocks. Undisputed Belts takes things much further by offering a championship belt that is 100% customizable. They customize these belts for you by etching graphics that you provide onto a blank belt! This is truly a unique customization option that I haven't seen offered by any other merchant. How cool would it look to have your league's own logo emblazoned onto a championship belt? It's not just the center plate of the belt that you get to customize with your own graphics. You can also customize the two side plates and the two end plates. That provides a lot of room for creative freedom and has resulted in some truly awesome original designs. Undisputed Belts will also work with you on your belt concept until you're satisfied with their proofs of your design. There is no limit to the number of revisions you can request. Although some of the trophies sold by Undisputed Belts do have space for an engraving plate, they do not offer any engraving services. Normally I would penalize a merchant for lacking these services. However, the customization options for their belts are so impressive that I'm still going to award them five stars in the customizations category. So you know that Undisputed Belts produces unique, high-quality championship belts and other types of awards. These products are indeed priced at a premium, and for good reason. But do they accept discount codes? Can you find coupons online that you can apply to your purchase? What about contests where you can win one of these masterpieces for your sports leagues? Do they give you anything for free? Let's look at how Undisputed Belts stacks up when it comes to discount codes, coupon codes, contests, and extras. As you browse around the Undisputed Belts website, you'll notice that they offer free shipping with every purchase. Even a blank endplate, the cheapest product on their site, ships free. Although you can find some coupon sites advertising discount codes for Undisputed Belts, they don't work. Because they offer such a popular product, I don't believe they bother with coupons. These guys have also been known to give away belts in contests promoted through their Facebook page and Instagram account. Back in March, they awarded a customized NCAA March Madness Championship belt to the lucky winner of a March Madness Facebook group. If you're looking to buy several championship belts, either for yourself or to re-sell, Undisputed Belts offers considerable discounts. As an example, their standard, blank customizable championship belt retails for $199. But if you purchase a set of 5, you'll get them for only $69 each. You can get similar deals by purchasing other belts in bulk, each with a savings of over 65%! If you need multiple belts for any reason (or want to start selling belts for your own business) you can't go wrong with those prices. Most of the products sold by Undisputed Belts are priced at a premium. A few exceptions might be their championship rings and some of their belt accessories. But this is not at all surprising considering they're producing high-quality (and in many cases, hand-crafted) products. Still, I don't think there is any question that the value they're delivering with their belts is off the charts. Everywhere you look on the Internet, people (and most importantly, their actual customers) are blown away by the craftsmanship of their belts. The products sold through Undisputed Belts are truly incredible and are well worth the price. To be completely honest, I'm someone surprised that they're not much more expensive (especially their custom belts). Although you can find positive customer reviews on their website, it's always best to consider reviews from other sources. The most unbiased Undisputed Belts reviews an be found on Amazon. Although they don't sell all of their products on Amazon, you can get a good idea of their overall customer satisfaction by looking at feedback for these items. After a thorough review of Undisputed Belts, I have to say I'm very impressed with what they've been able to accomplish. Fantasy football trophies are quickly becoming an afterthought in leagues that are looking for something new and exciting to improve their drafts and raise their prize standards. If you're looking to make a statement in your league for the upcoming fantasy football season, a championship belt from Undisputed Belts would be an obvious choice. Your league owners will love you for it. Customize one of their belts with your own league logo and you're sure to the draft day hero.